Happy New Year everyone! I hope 2015 has been treating you well so far. One of the first things on my agenda this year, as far as the blog is concerned, is to put together a longer post about Daredevil on Netflix. That’s something that might take a few hours, however, and I didn’t want to put off my first post of the year for much longer. 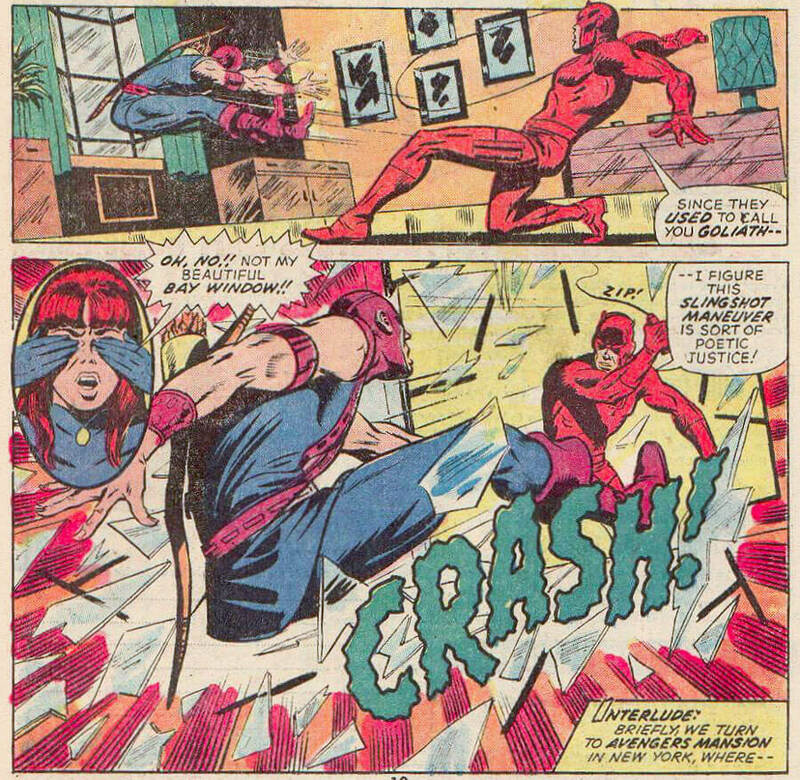 So, for this first post, I thought it might be fun to look at the fight scene between Daredevil and Hawkeye that was referenced in Daredevil #11. The perspectives are a little different. 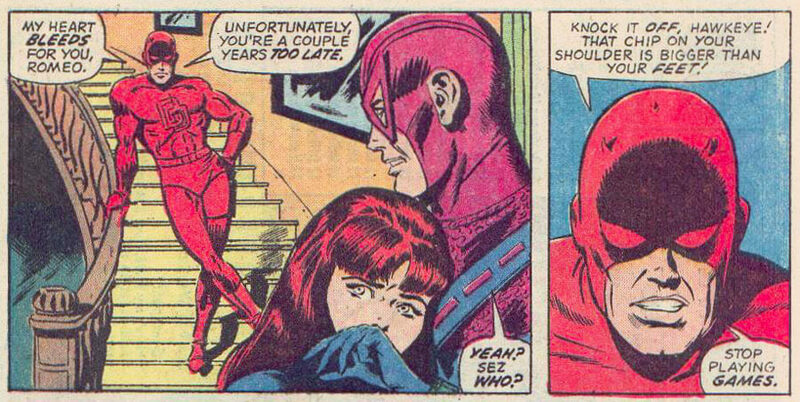 The more recent issue has a clearer focus on Daredevil, which seems apt under the circumstances, and the angle brings the Black Widow into the scene. 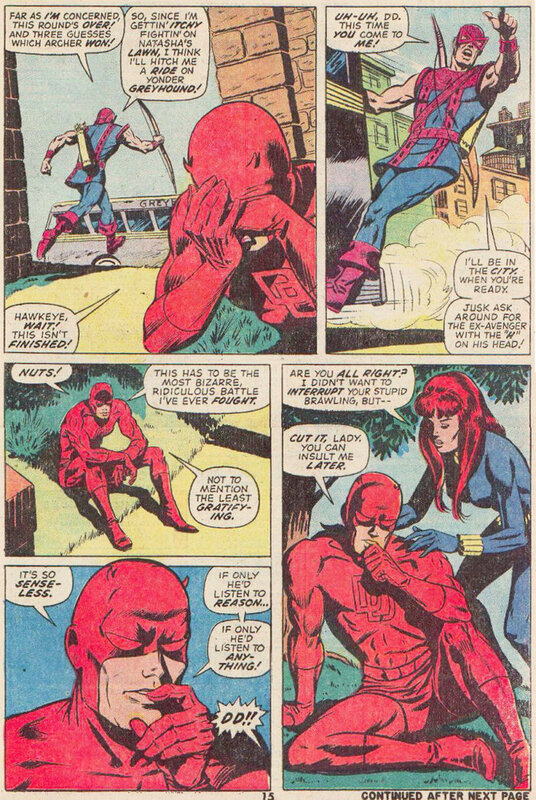 Daredevil #11 also leaves out the part about the Black Widow bemoaning the destruction of her beautiful windows. Probably a wise decision. Well, this part happens pretty much the way Foggy tell its, but the original unsurprisingly offers a longer, and even more hilarious scene. In my head, I’m going to imagine that “Archer, you’ve flipped” is now something Matt works into conversations when he meets Clint Barton, as an inside joke reminding the two of their first, spectacularly absurd meeting. After Hawkeye leaves the scene, he runs into a gang of street thugs to do battle with (because, why not?) when Daredevil shows up. 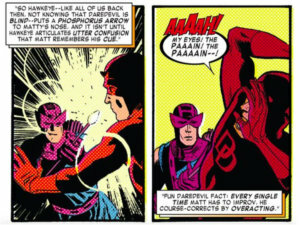 The latter is then attacked by an arrow that releases a gas which does a real number on Matt’s senses. This is followed by a sonic arrow that really has him begging for mercy. 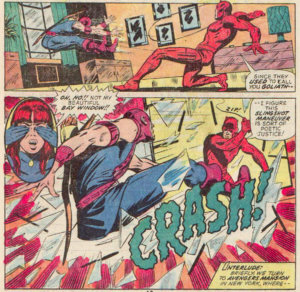 I guess Clint just got really lucky choosing among his trick arrows because they seem perfectly suited to Daredevil’s weaknesses, which he knew nothing about at the time. 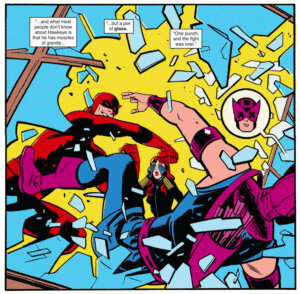 Daredevil then rebounds, breaks Hawkeye’s bow – and makes it look way too easy, by the way – before they both get to play with Daredevil’s billy club. Finally, the two settle things and call it a draw. There are many things to like about this quote. The play on the lyrics to The Twelve Days of Christmas, the use of the word “yonder”, the suggestion that Clint keeps immaculate track of time, and the juicy clown insult at the very end. As you can imagine though, things go downhill from here. Both Daredevil and Hawkeye act like jerks, while the Black Widow – the only reasonable person for most of the issue – tries unsuccessfully to get across that she is capable of choosing her own boyfriend. Here are some highlights. At the very end of the issue, the two combatants return to the home of Matt and Natasha, and find some of the Avengers. 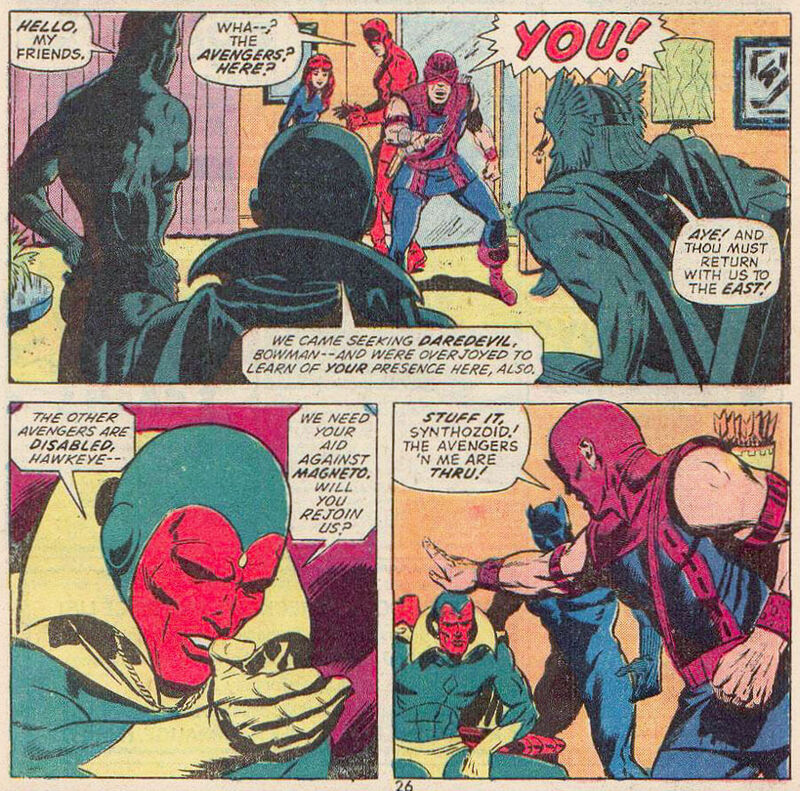 They are there to ask Daredevil to join them on a mission – he later accepts – but the self-proclaimed ex-avenger Hawkeye is not happy to see his old team mates, especially not the Vision, with whom he’s had a falling out (in Avengers #109). Cool and fun post! 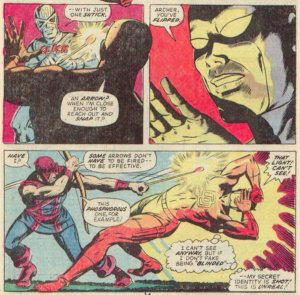 It was really neat for Waid to reference a previous encounter from DD’s lore. I think it adds more depth and or weight to the characters when they mention a previous encounter from years past of continuity. And fun for the reader to either read excellent posts as this and/ or search for that mentioned back issue. Looking for lost, inexpensive, gems like this are for to hunt down for me. Happy new year! Great post! When they met? It’s an awesome fight! I want to watch this fight on movie, I hope this will be shown on this upcoming Daredevil movie. Try to check it here guys http://www.exploretalent.com/articles/marvels-daredevil-joins-netflix-club/ . About Daredevil.